Softlinx’ ReplixFax Server delivers a high-performance, virtualized FoIP solution tailored to your organization’s network environment. With ReplixFax, you can benefit from an enterprise Fax over IP fax server to manage your corporate faxing requirements leveraging your Voice over IP (VoIP) network infrastructure. Fax over IP software, or FoIP, allows organizations to send and receive faxes over their Voice over IP (VoIP) network. The big differentiating factor for IP Faxing is that these fax messages don’t require phone numbers — just IP addresses. In a Voice over IP or VoIP network, each IP endpoint is already equipped with a media gateway. 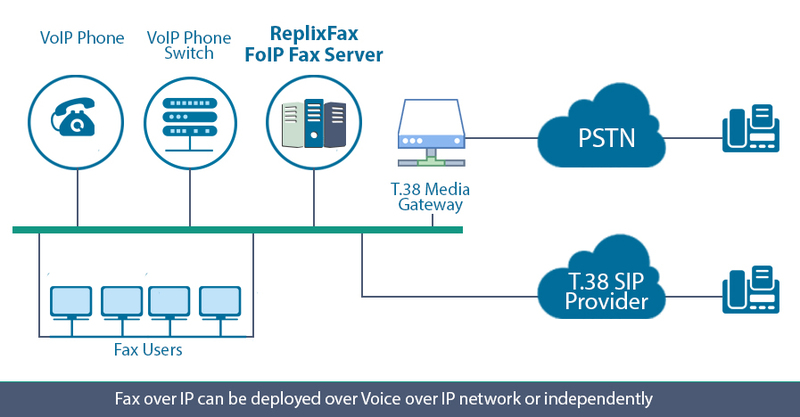 Even if you don’t have a VoIP network in place, you can still implement FoIP fax in your workplace and virtualize your fax servers by using a media gateway. This gateway must support either a T.38 FoIP protocol or a G.711 protocol on your company’s internal IP network. T.38 FoIP is also called “real-time faxing,” which means the fax messages are both sent and received at the same time instead of waiting to be stored. From the outside, this looks a lot like traditional faxing but can use computers. More often than not, IP fax machines are used in corporate environments. The G.711 protocol is the simpler version of this and can be used as a backup if a T.38 call doesn’t go through properly. This method tends to have more problems, primarily in that the signal can be compressed. This can be prevented with proper software hooked up to your VoIP line. The important part of this fax method as a whole, however, is the presence of a fax gateway or server to handle the fax message. The result is the same: an easy-to-implement faxing solution that can work with just about any established business system. The ReplixFax FoIP server is certified for both Dialogic Brooktrout SR140 fax software for boardless fax over IP implementation and Dialogic Brooktrout TR1034 fax board for more traditional hardware based telephony implementation. The ReplixFax Fax over IP solutions are compliant with T.38, SIP and H.323 industry standards. It’s also compliant with G.711 as a fallback if a T.38 call is unsuccessful. The ReplixFax enterprise fax over IP solutions are optimized for mid-to-large enterprise FoIP deployment. The ReplixFax Fax over IP server supports fax server virtualization and out-of-the-box ReplixFax fax server clustering for scalability, performance and system availability. The software interoperates with Voice over IP phone switches and media gateways from most leading vendors such as Cisco, Avaya, ShoreTel, Siemens, Alcatel and Dialogic. Contact Softlinx for checking interoperability with your specific IP network environment and configuration recommendations. Leverages the IP network infrastructure for maximum efficiency of the business’ server capacity and network resources. Reduces network complexity and administrative overhead by consolidating voice, fax and data on a single converged network. Eliminates the need to install remote fax servers and hardware modem boards, reducing equipment costs. Increases server hardware utilization via fax server virtualization, further reducing equipment and utility maintenance costs.